FILE - Angolan President Joao Lourenco speaks during a press conference in Luanda, Angola, Sept. 18, 2018. Even the toughest critics of Angola’s government say that in just more than a year, President Joao Lourenco has accomplished more to stop corruption than any previous Angolan administration. Lourenco took power last September after the retirement of longtime president Jose Eduardo dos Santos, whose cronies and family members are alleged to have controlled every important company and source of wealth in the country. But in the year since the transition, Lourenco has swept away an impressive number of allegedly corrupt top officials who, under dos Santos, were considered untouchable. Most notably, the ex-president’s son Filomeno, who ran the nation’s sovereign wealth fund, was arrested this week on allegations of money-laundering, embezzlement, and fraud. Journalist and human rights activist Rafael Marques, who was arrested and put on trial for his corruption exposés during the dos Santos era, says the new president deserves praise. 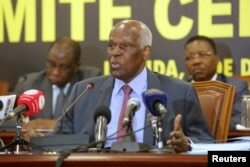 FILE - Jose Eduardo dos Santos, Angola's president at the time, attends a party meeting in Luanda, Angola, Dec. 2, 2016. During his years in power, dos Santos is alleged to have overseen an endemic culture of corruption. And the purge has been rewarded, says Alex Vines, who heads the Africa Program for research group Chatham House. The nation’s biggest investors, international oil and gas companies, have decided not to pull out of the resource-rich nation. But, he says, more needs to be done to rebuild the country. “This is a transition process still, it will progress in fits and starts, but I think we are beginning to see that these reform efforts aren’t just about the consolidation of power from dos Santos to Lourenco, but is beginning to become a bit more equitable,” he said. Lourenco, he notes, is a shrewd politician, having risen to prominence within the ruling People’s Movement for the Liberation of Angola in 1984. He now has to gird his party for its next challenge, Vines says. But Marques says for the party to pull ahead, it needs to improve the economy and ensure millions of unemployed Angolans can find jobs.